The term "martial art" describes a variety of Asian hand-to-hand combat methods and sports. These fighting sports include those developed in the 6th Century by both the Shaolin monks in China and hwarang warriors in the Korean kingdom of Silla and later by the samurai warriors of feudal Japan. When Bodhidharma introduced Buddhism to China from India at Shaolin in Hunan Province in the 6th Century, he founded the Ch’an sect (which is called "Zen" in Japanese) and taught his followers to strive for spiritual enlightenment through meditation. Legend has it that when Bodhidharma attempted to lead his Chinese followers in long sessions of meditation, they did not have sufficient endurance to pursue his training, so he devised a regimen of Ch’an Tao Kune kung fu exercises to develop their physical fitness. These exercises evolved into methods of self-defense and combat which made the Shaolin monks well known as fierce warriors. By the time the Manchu destroyed the Shaolin temple in the 19th Century, many variations of the Shaolin monks’ combat techniques had spread throughout Asia. Many of these techniques included the use of swords, spears and other weapons. From these early martial arts developed on the Asian mainland, karate emerged on the island of Okinawa in the 15th Century as an unarmed method of self defense, after the common people were forbidden by their ruler to possess weapons. When Okinawa fell to the Satsuma clan of Japan in 1609, the Okinawans had to defend themselves against the samurai with only their hands and feet. The samurai used jujutsu as their hand-to-hand combat method, emphasizing techniques of grabbing and throwing one’s opponent. From jujutsu, Jigoro Kano of Japan founded the sport of judo in 1881. The word "judo" literally means "the yielding way" and utilizes methods of leverage to gain advantage over one’s opponent. The Mandarin Chinese advanced the Shaolin monks’ kung fu into a martial art which uses a wide range of combative maneuvers. 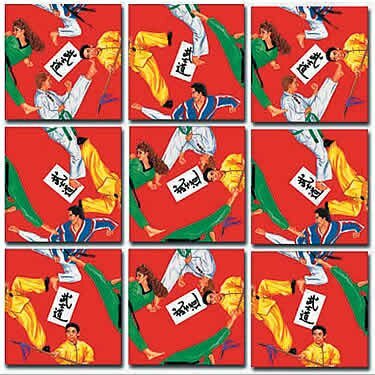 A Korean martial art, tae kwon do, which emphasizes high kicking and body punching, literally means the "way of smashing with feet and fists." Today, at dojos (places where the way of Zen meditation and martial arts are practiced) throughout the entire world, men, women and children of all ages study these various methods of martial arts for self defense, self confidence, agility and physical fitness.